A Little Bit etc. : Versatile Workwear Pieces + Answering a Bunch of Reader Questions! 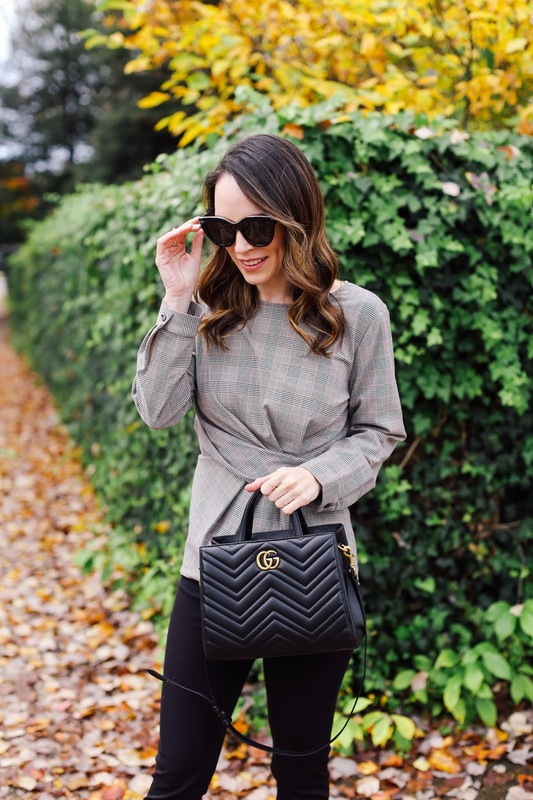 Versatile Workwear Pieces + Answering a Bunch of Reader Questions! I can hardly believe Thanksgiving is this week but I am so excited for the holiday season! I did more decorating this weekend and am planning some fun activities to do with Miles in the next few weeks. I can't wait to dress him up in all the most ridiculous holiday gear I can find. Ha! We took these blog pictures a few days before a cold front hit so all this beautiful fall foliage is gone. And I didn't need a coat this day which was so nice. The wrap style of this shirt was what instantly drew me in - I love anything that accentuates the waistline. And while these pants looked like leggings, they have a zipper detail on the inner ankle that I thought made them so much more interesting than basic black pants! Ann Taylor was one of my favorite places to shop when I was at my previous corporate job and I still love finding pieces that work with my current lifestyle. This outfit looks great styled together, but I also love wearing the top with jeans and slides, and the black pants are easy to wear with almost anything in my closet. 1. How did you get started in the beauty industry? I started on the sales floor at Sephora believe it or not! I worked retail in college and then worked at Sephora when I first moved to NYC. From there I worked my way up the career ladder. 2. Favorite snack? Healthy-wise I'm loving Skinny Pop for nights I want to mindlessly snack. For unhealthy snacks, I love hors d'oeuvres - pigs in a blanket, puffed pastry anything, spinach balls, etc. I also LOVE a charcuterie board. That is probably my favorite thing to eat at restaurants with Stan when we just want to have a quick bite. 3. Favorite holiday? My parents made Christmas so much fun as a child so it's one of my favorites, as is Halloween because my birthday is 3 days before. 4. How did you meet Stan? Stan and I met through someone that worked for me. She and I were very close and she thought Stan and I would hit it off. Before Stan though, I dated online for years and am still a huge proponent of meeting people that way. Though I didn't end up with someone I met online, I have tons of friends that did! 5. Where did you go to college? I went to James Madison University for two years but didn't love it. It's in the mountains and there wasn't much to do. I was not interested in joining a sorority (which was a big thing on that campus) so I decided to move back home and finish getting my degree at Old Dominion University. 6. Do you miss living in NYC? If so, what do you miss most about it? Some days I do but I really enjoyed my time when I lived there so when I left, I felt like I had gotten everything out of NYC that I could. The thing that Stan and I miss the most from NYC is the food. Stan is a MAJOR foodie. He lives to eat and will seek out the best local fare anywhere we go. We went to fancy places in NYC but Stan was amazing at finding the most random, small and obscure places that had one incredible dish. We once stopped at a gas station during our travels because Stan heard the food truck in the parking lot served the best tacos (and they were pretty amazing)- his love for food is infectious and so much fun. 7. Do you want more kids? I'm not really sure to be honest. There are days that I think yes, and days that I think no. Only time will tell I suppose. 8. How you would describe your fashion style? Polished and put together. I don't think of myself as preppy or classic or edgy or over the top glam, but one thing people have always said about me is that I look put together. So even in ripped jeans and a beanie, I will have my hair done, wear a bit of makeup, make sure everything is steamed and that things fit well. 9. What was the worst beauty trend you tried when you were younger? I used to sport dark lip liner with a lighter lip color. Eek! It was not a cute look. I didn't overdo it but nonetheless it was not flattering. I also used to wear VERY colorful eye makeup. It became a bit more acceptable when I went to work at a cosmetics counter so I supposed my crazy makeup trends led me to my career today! 10. What was your skincare regimen when pregnant? Skincare during pregnancy is a very personal decision so I didn't write any specific blog posts on this topic because what I was comfortable using may not necessarily be what others are comfortable using. I always direct people to speak with their doctor regarding this topic. However, I felt comfortable using most of the products I use now with the exception of my strong retinols. 11. What is the best tip for wearing SUPER dark lipstick? Keep the rest of your makeup VERY simple. Tons of mascara looks great with a bold or dark lip. Also, be sure to put a pop of color on your cheeks. This helps to lessen the harshness of the lipstick and warm up the face. 12. Have you ever used the Dr. Dennis Gross peel pads? Yes and I love them! 13. How do you stay so positive? You always seem happy. Have you ever suffered from depression? I think I portray a positive outlook now because I love what I do and feel very grateful that my hard work has paid off and I can make blogging my career. However I am a very anxious person and have struggled with depression at different times in my life. I'm a big proponent of therapy and think it is incredibly important to invest in your health and mental well-being. I have had incredible therapists help me work through issues and develop coping techniques/behaviors that I apply to every aspect of my life. Thinking positive takes practice so I actively work at it every day. Just like any new habit, it can be difficult at first but gets easier over time. When anything bad used to happen, I would say things like "that figures" or "of course this happened" which contributed to my negative attitude. I made a conscious effort to acknowledge any good thing that would happen (no matter how small), and say out loud (this really helped) those same words I used to say when something bad occurred. It was amazing how my attitude started to change when I confirmed all the positive things that were happening for me. I began to expect a positive outcome rather than a negative one. I'm not naive to think nothing bad with ever happen again (I've been through enough in my life to know this), but it's exhausting to only focus on the negative. Hope you enjoyed this post! I only answered a handful of the questions I received but will definitely do another Q&A post again soon. Don't forget to stop by The Holiday Shop as I just updated it with all new pieces! So cool to hear your answers and get to know you a bit better! Been following you so long now and loving your journey!